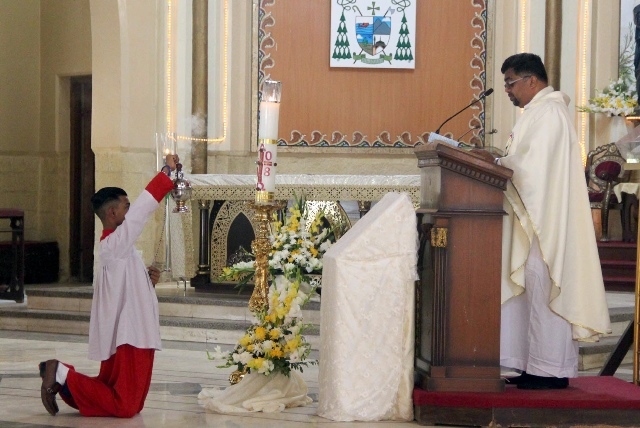 The Christian community celebrated Easter on Sunday with great religious fervor in Karachi. Prayers at Saint Patrick’s Cathedral started on Saturday night. Men, women and children belonging to the Christian community participated in special midnight services to mark the beginning of Easter, while another mass was held on Sunday morning. The melodic sound of hymns by the choir filled the air at Saint Patrick’s Cathedral where the biggest and most impressive celebrations in the metropolis were held to mark Easter. Worshipers started pouring in around 10pm on Saturday whereas the prayers started around 11pm and continued till around 2am. The annual festival marks the resurrection of Jesus Christ. 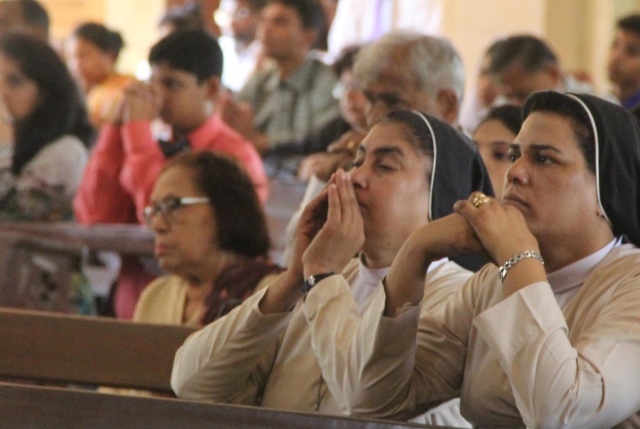 “Easter is the culmination of the 40-day lent period, a time of fasting, almsgiving, repentance and spiritual renewal,” said Nazeer Masih, who had come to attend the midnight mass along with his four-member family. According to Masih, Easter Sunday is the holiest day in the Christian calendar. His daughter Nancy remarked that it is a moment of jubilation after the culmination of the entire year’s worship and 40 days of fasting by Christians. According to her, the message of Jesus Christ was to spread love, peace, tolerance and brotherhood among the people of the world. According to Sarah Pinto, the feast is supposed to be the greatest feast of the year. While narrating the sequence of events that took place during Easter, she said that the priest reminded the churchgoers that Christ’s rising was a blessed and happy moment for the entire world. “Easter is a day of triumph over death,” she explained, adding that along with along the traditional prayers during mass, prayers for solidarity and peace in the country were also offered. The day is usually celebrated by wearing new clothes, exchanging sweets, and inviting over loved ones for lunch or dinner. Pakistan Peoples Party (PPP) Chairperson Bilawal Bhutto Zardari celebrated Easter with the Christian community in Hyderabad at a local banquet hall. Along with the community’s representatives and Bishop Kaleem John, he also cut a cake. He said the PPP served the people regardless of their religion, creed or social status. Bilawal also credited his party for electing Christian and scheduled caste Hindu senators from Sindh in the recent Senate elections. Chief Minister Murad Ali Shah, provincial ministers Nisar Khuhro and Jam Khan Shoro and other legislators and leaders of the PPP also attended the event.